While technology news highlights stories of moving to the cloud, big data, and cyber security, IT teams deal with the reality of an information-driven business world: storing an ever-increasing amount of data. We seem to have an insatiable desire to keep everything from email to spreadsheets, just in case we might need them in the future. While the cost of disk-based storage continues to drop, the growth in data is far outstripping that rate. As if dealing with the technical challenge of managing all this data was not enough, IT is faced with another business challenge: how to handle data restoration for legal and regulatory events. These kinds of events are unpredictable from both a timing and scope perspective; they can wreak havoc with IT budgets and planning. Typical IT budgets are 80% “keeping the lights on” and 20% new business solutions. There is little to no room for unplanned events like electronic discovery requests. Unfortunately, such events are not discretionary, and IT has to find a way to handle them regardless of competing priorities. When the data is readily identifiable and available, the disruption may be minimal; however, sometimes the location of the data may be unclear or may be in obsolete formats or media. In these cases, IT can face a very difficult challenge. A fundamental issue is the disconnect between the speed of technology change and the legal need to retain data for many years. Typical technology life cycles are 3-5 years; typical legal retention requirements are 7-10 years. This means that IT may have changed technology twice during the retention lifespan of a typical piece of data. When technology vendors change data formats, IT may be left with the need to retain old hardware or software that can access the previous formats. Given that IT is required to capitalize most enterprise hardware and software, the need to retain multiple generations of technology can create a depreciation burden on already stressed budgets. Even if the fixed cost of depreciation in not an issue, the operating expenses for maintenance may be excessive. In either case, precious dollars are diverted from meeting the demand for new business solutions. IT organizations are designed with two basic teams: infrastructure and applications. Infrastructure teams may be organized by platform (desktop, compute, storage, networks, etc.) or by service (email, unified communications, file, and print, backup, security, etc.). Application teams are not our primary focus here but are typically organized around a business function such as finance, human resources, procurement, etc. The infrastructure team is usually responsible for handling data restoration events. Whether organized around platform or service, the team has a horizontal view of data; i.e., each platform or service may have its own backup and archiving approach and technology. Data restoration events tend to be vertical; i.e., data about a person or subject that may cross every platform or service. Therefore, IT is at an immediate disadvantage when faced with data restoration. Compound this with having to go back to data on obsolete media, and you can see why IT has to jump through hoops to handle data restoration events. 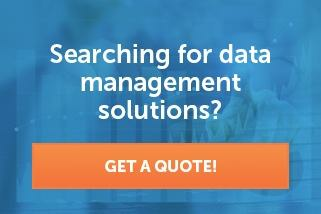 With the exception of email, it is not easy to identify data that may be relevant to a data restoration event. For example, a Microsoft Word file will have a creation and “last updated date”, but any other identifying information is unreliable. This is because people often create documents from templates and never bother to change the metadata describing the author or description. Even the “last updated” date is unreliable, as it changes if the file is copied from one place to another. There are specialized forensic tools that can be used to retrieve data from damaged or obsolete media. These tools are not found in most IT teams, nor is the expertise needed to use them effectively. It makes more sense to work with a trusted partner for these needs, rather than trying to maintain the expertise in house. With the rise of cloud computing, SaaS-based applications, and managed service providers, today’s CIO is becoming more of a “service broker” rather than the direct owner of technology. Just as other parts of the business have had to shed non-core services to third parties, IT is going through this same transformation. While outsourcing IT used to be an all or nothing proposition, the CIO can now be selective about what stays in-house and what can be handed off to service providers. Data restoration is a prime candidate for a trusted partner, especially if that partner is already helping to manage archived data for your firm. While in some cases it makes sense to hire data restoration services on demand, the reality is that the need for this kind of service is only going to rise as more and more information becomes electronic rather than paper based. Having a service provider who understands your environment, understands the nuances of legal and regulatory requirements, and can respond at any time will be a key part of IT’s service portfolio. Learn more about TDS’s tailored managed service offering Restoration Assurance Program. Fill out this form or give us a call at 844-679-7600 to get in touch.